Association members James Hargrove, Carol Talley, and Terry Kemp compiled text and photographs to recount the role of the lighthouse in over 180 years of Apalachicola’s maritime history. The final layout was completed by local graphic designer, Cindy Clark. The narrative begins with the 1804 Forbes Purchase and describes the need for the lighthouse as an aid to navigation to protect ships engaged in the cotton trade from the shoals around the passes into Apalachicola Bay. The earliest lighthouse was built at West Pass in 1833, and was rebuilt on Cape St. George in 1848. After the great Florida hurricane of 1851, a stronger tower that survived for 153 years was built on the Cape in 1852. The new booklet describes the earliest lights and the 1857 conversion to the more powerful beam produced by a third-order Fresnel lens. The narrative summarizes events that interrupted commerce during the Civil War and the resumption of trade during Reconstruction. Also highlighted are the lives of prominent lighthouse keepers and their families, including Edward Porter, Pearl Porter Marshall, and members of the Walter Roberts family. Vintage photographs illustrate keepers’ lives and the narrative includes information from current displays and digital archives from the Lighthouse Museum and Gift Shop in Lighthouse Park on St. George Island. The booklet concludes with the story of the collapse of the lighthouse in 2005 after several hurricanes surged through the area, and its reconstruction through the persistent work of many Franklin County residents and volunteers. 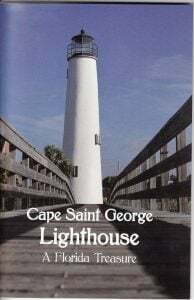 “Cape Saint George Lighthouse, A Florida Treasure” is available at the Lighthouse Gift Shop adjacent to the lighthouse at the center of St. George Island. All proceeds will be used to support ongoing maintenance and updates of the Cape St. George Lighthouse by the non-profit St. George Lighthouse Association. For more information, please contact the Lighthouse Gift Shop at 850-927-7745.